Ready for your best Symi holiday yet? The Hotel Fiona and the Fiona Studios are always in demand, and in the peak season it’s recommended that you plan your booking as early as possible. English, Greek and Italian spoken. 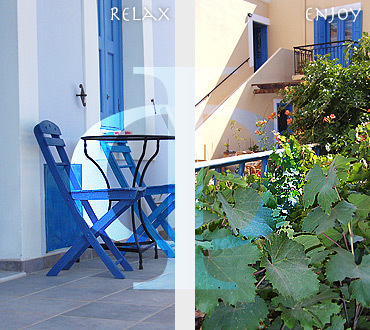 "Our room was simple but cozy and clean with blue shutters that opened out onto a small balcony and STUPENDOUS views. We never tired of sitting at all hours soaking up the atmosphere from our perch, day.. or night!" "Not much to say besides one of the most pleasurable and memorable experiences we've ever had. Extremely well priced, this hotel offers a perfect experience for the nicest Greek island I've been to. Clean and comfortable with traditional greek service and style. Our room had a beautiful view."